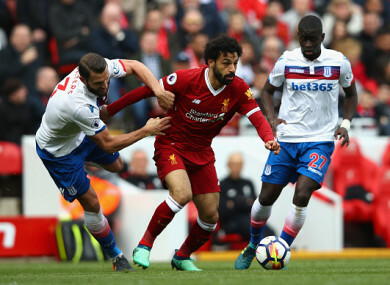 Goal 44 of an incredible season proved elusive for Mohamed Salah but a 0-0 draw at Liverpool did Stoke City few favours. Mohamed Salah failed to score against Stoke on a frustrating afternoon for Liverpool. The club paid their support to Sean Cox before kick-off, hanging a St Peter’s GAA jersey inside the Anfield dressing room for the Dunboyne father of three who was attacked before their Champions League semi-final with Roma. There was late drama as Pieters fortuitously survived a penalty shout for handball before Shawcross, a Stoke mainstay since their promotion a decade ago, came agonisingly close to smuggling home the winning goal his club badly needed. Email “Salah draws rare blank in Anfield stalemate as relegation looms for Potters”. Feedback on “Salah draws rare blank in Anfield stalemate as relegation looms for Potters”.